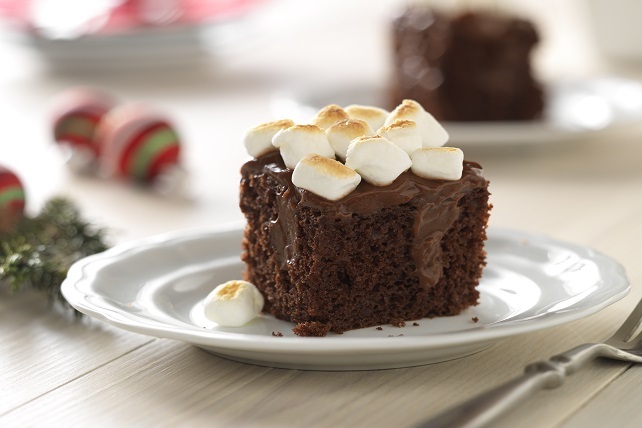 Thanks to devil's food cake mix and instant pudding, even a novice baker can make this impressive Toasted Marshmallow-Chocolate Pudding Poke Cake. Prepare cake batter and bake in 13x9-inch pan as directed on package. Cool cake in pan 15 min. Pierce cake at 3/4-inch intervals with handle of wooden spoon, using turning motion to make large holes. Beat pudding mixes and milk in large bowl with whisk 2 min. Immediately pour half the pudding evenly over warm cake. Let remaining pudding stand 5 min. or until slightly thickened; spread over cake. Top with marshmallows. Refrigerate 1 hour. Heat broiler when ready to serve cake. Broil cake, 6 inches from heat, 1 to 2 min. or until marshmallows are golden brown. Cool slightly. Prepare using a lemon cake mix and 2 pkg. (3.4 oz. each) JELL-O Lemon Flavor Instant Pudding. Prepare using a yellow cake mix and JELL-O Pumpkin Spice Flavor Instant Pudding. Substitute a chopstick or drinking straw for the spoon handle.